Premium Glossy, Matte, Silk, Plastic and Thick, Custom Business Cards. *Free ground shipping on business card quantities listed, shipping within the continental U.S. Need a Custom Business Card Design, Free Printing Quote or help with ordering? Call us at (702) 589-6429 to speak with a Printing Expert. Order Premium Quality Business Cards. You only have one chance to make a good impression. Our premium print quality, full color, custom printed Business Cards set the industry standard for exceptional quality. Choose from the widest selection of card stocks and coating options offered anywhere! 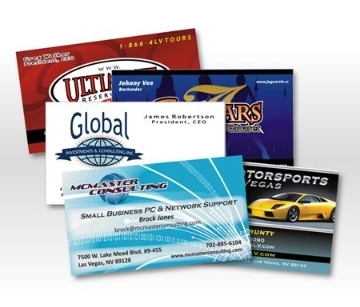 Our Business Card printing services feature exclusive 14pt. and 16pt. thick, premium card stocks with your choice of coating options including Aqueous High Gloss, Aqueous Silk, High Gloss UV or Matte Finish.